The easiest way to implement Single Sign-On for Salesforce with any identity provider. Just 3 Steps with Auth0. Single Sign On for Salesforce allows your users to log into Salesforce with Active Directory, LDAP, Google Apps, social identity providers and more. Auth0’s Active Directory/LDAP connector is a real-time outbound authentication, so user credentials stay behind the firewall. Users log in once and don’t get prompted for credentials each time they try to access Salesforce. Learn how to implement SSO for Salesforce with any identity provider in just 3 steps with Auth0, an identity management solution. Get extra security features and social login with a flip of a switch. Single Sign On works by having a central server, which all the applications trust. When you login for the first time a cookie gets created on this central server. Then, whenever you try to access a second application, you get redirected to the central server, if you already have a cookie there, you will get redirected directly to the app with a token, without login prompts, which means you’re already logged in. Auth0 issues secure JWT (JSON Web Token) authentication for apps running on any stack on any device. On the dashboard, select your enterprise or social identity provider. If you’re connecting with Active Directory/LDAP, we provide a real-time outbound AD connector. On the dashboard, select Saleforce SSO integrations and enter your Salesforce account details. Enabling social (e.g. 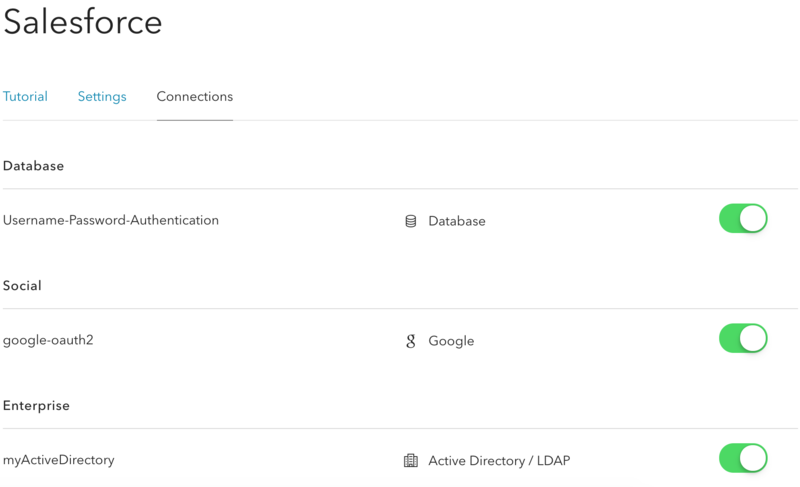 Facebook, Google, etc) and enterprise (Active Directory, LDAP, SAML, Google Apps, Office 365 login, etc) connections is literally flipping a switch.